A world without polio is within our reach. Today, Rotary is on the brink of eradicating a human disease for only the second time in history. There are fewer polio cases today than ever before, but we will not stop until we reach zero. 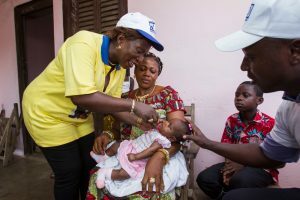 A child in West Africa received a polio vaccination. If polio is not eradicated, hundreds of thousands of children could be paralyzed. Global health care costs would rise dramatically, and many children’s quality of life would be drastically diminished. Improve surveillance systems to diagnose new cases. Hire 150,000 health workers to find and vaccinate every child. We hope you will embrace Rotary’s dream of a polio-free world and make a donation by May 15th.